Since 1961, Scribes--The American Society of Legal Writers--has presented an annual award for the best work of legal scholarship published during the previous year. The Scribes Book-Award Committee receives between 30 and 40 nominees each year. 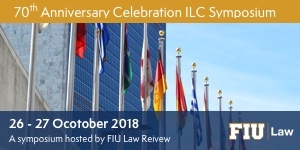 The Scribes Book Award is presented at a CLE program held in conjunction with the Scribes' annual meeting, which this year will be held in Washington, D.C. on Friday, April 12, 2019.
International law experts may remember that the 2018 winner of the Scribes Book Award was The Internationalists: How a Radical Plan to Outlaw War Remade the World by Oona A. Hathaway and Scott J. Shapiro. Honorable mentions went to The Color of Law: A Forgotten History of How Our Government Segregated America by Richard Rothstein, and to Miles Lord: The Maverick Judge Who Brought Corporate America to Justice by Roberta Walburn. Nominations for the 2019 Scribes Book Award will be accepted until February 15, 2019. To nominate a book for this year's book award, all a publisher needs to do is send a copy to each of our book award committee members. For more information, please contact the Executive Director of Scribes, Philip Johnson, at scribesleglwriters@gmail.com.